I know exactly who I am. I’m the Doctor. Sorting out fair play throughout the universe. For reference, the length of this work is: 60 min. 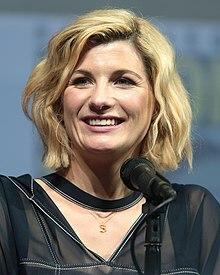 This page is a collection of quotations from the era of the thirteenth official incarnation of the Doctor from the BBC science fiction television programme Doctor Who, portrayed by British actor Jodie Whittaker. The Doctor: [Seeing her new face.] Oh, brilliant! Yazmin Khan: Hold on there please, madam, I need you to do what I say. This could be a potential crime scene. Yaz: …Because you’re a woman. The Doctor: Oh, yeah! I remember. Sorry, half an hour ago I was a white-haired Scotsman. The Doctor: Don't panic. Not the end of the world. Well, it could be the end of the world, but one thing at a time. Ryan: No! All my stuff’s on there. Yaz: What do we do when we get up there? The Doctor: Don’t worry, I’ve got a plan. The Doctor: Well, I will have by the time we get to the top. Tzim-Sha: A Stenza warrior wears his conquests. You may tell your children you were once privileged to encounter Tzim-Sha of the Stenza. Tzim-Sha: Tzim-Sha! Soon to be leader of the Stenza warrior race, conquerors of the Nine Systems. The Doctor: When you say soon to be leader, what are you now, the office junior? Graham: Eh? No, don't wind him up. Ryan: How'd you cope with that? The Doctor: I carry them with me. What they would have thought, and said, and done. Make them a part of who I am. So even though they’re gone from the world, they’re never gone from me. The Doctor: Oh, by the way, welcome to what I presume is your first alien planet! Don't touch anything. The Doctor [lending her sunglasses to Graham]: Like an old pair of mine. I say mine — I can’t remember who I borrowed them off now. It was either Audrey Hepburn or Pythagoras. Graham: Eh? Pythagoras never wore shades. The Doctor: Obviously you never saw him with a hangover. The Doctor: Hologram. Thought it might be. Good one, though. I love a good hologram. I was a hologram once. For three weeks. The gossip I picked up. Epzo: I don’t need other people. Graham: We all need other people, mate. Epzo: We’re all alone. That’s how we start, and end, and its the natural state of all points in between. Graham: Were you born that miserable, or did you have to work at it? Epzo: You know, when I was four my mum told me to climb a tree. She made me climb until I was too scared to climb any higher. Then she told me to jump into her arms. “Don’t worry,” she said. “I’m your mum. I’m here for you. I’ll catch you.” So I jumped. And she moved out of the way. Yaz: Sorry, did you say your mum did this to you? Ryan: That is messed up. Epzo: Best thing she ever did for me. I loved my mum. Graham: [sarcastically] Yeah, she sounds terrific. The Doctor: Your mum was wrong. We’re stronger together. The Doctor: Now do you see why I don’t like guns? Ryan: Don’t go on about it. The Doctor: Oh, I will go on about it! A lot. Graham: 1955? Elvis, can we see Elvis? The Doctor: I think he’s in New York this week. I could give him a call. Graham: You haven’t got Elvis’s phone number. The Doctor: Don’t ever tell anyone I lent him a mobile phone. Waitress: We don’t serve Negroes. Ryan: Good. 'Cause I don't eat them. The Doctor: Is anyone excited? 'Cause I'm really excited. Graham: You won't be if it's a bomb. The Doctor: Don't kill the vibe, Graham. Graham: Oi, whoah, whoah, whoah! What are you doing? That is vandalism. We’ll have to pay for that! The Doctor: Don’t worry, special pen. Graham: No! Pack it in. You ain’t Banksy. The Doctor: Or am I? The Doctor: Banksy doesn’t have one of those… Or have I? Yaz: Everything here is a fight for you. Don’t you get tired? What keeps you going? Rosa Parks: The promise of tomorrow. When today isn’t working, tomorrow is what you have. Yaz: What are you gonna do now? The Doctor: Oh, you know, back in the box. There's loads to see. The Doctor: [sadly] Yeah, I suppose. Yaz: Do you want to come for tea at mine? The Doctor: [suddenly brightens] Definitely! Yes I would! Thanks. I love tea. Tea at Yaz's? Amazing! The Doctor: Ooh, fun fact: If you weave dragline spider silk as thick as a pencil, it’s strong enough to stop a plane in flight. The Doctor: I'm not! I’ve had to deal with it. Well, me and Amelia Earhart. You'd like her, she’s a right laugh. The Doctor: [Showing Psychic Paper] Crisis Investigators. You just ran really quickly out of a room looking really scared. Tell me exactly what's going on, omitting no detail, no matter how strange. Jack Robertson: A giant spider just smashed through my bathtub and took out my bodyguard, Kevin. The Doctor: Right. Very succinct summary, well done. Yaz: [To The Doctor] So, what do we do? Jack Robertson: Why are you asking her? Ryan: Cos she's in charge, bro. Graham, Yaz & Ryan: Says Us! The Doctor: I eat danger for breakfast. I don’t, I prefer cereal. Or croissants. Or those little fried Portuguese—never mind, it's not important. Jack Robertson: You are not authorized to go in here! The Doctor: Dude, I’ve all the authorization I ever need. [To Yaz] I call people “dude” now. Graham: You see, Doc, the thing about grief is it needs time, and… Well, I don’t want to sit around my house waiting for it to go away, 'cause that house is full of Grace, and it makes it so much harder. But, um, being with you and seeing all these things… it really helps. The Doctor: Pick a number between 1 and 100. The Doctor: Pentagonal number. Interesting. [She sonics a bomb] Get in that corner. Yaz: What was the number for? The Doctor: Number of seconds before the bomb goes off. I moved it forward a bit. Yaz: What?! I would've gone higher! The Doctor: Good number, 51! Atomic number of antimony. Number of Federalist Papers written by Alexander Hamilton. I love that show, I've seen all 900 casts. Yaz: I'm really trusting you on this bomb, but I don't know what you're doing. The Doctor: Think of the Pting as a mouse and the bomb as a piece of cheese. Yaz: A very large piece of cheese about to explode and take us all with it! The Doctor: It's not a perfect analogy, I'll admit. You could've picked a bigger number! Doctor: I need oil, water, tree bark, a saucepan, nine containers, an old newspaper, a touch of ox spit, a chicken poo, and a biscuit. Ryan: Bagsy not chicken poo! The Doctor: I love biscuits! Ryan: Did you hear the noises in the valley in the night? Ryan: Who's doing this stuff? Prem Ordinary people who've lived here all their lives, whipped into a frenzy to be part of a mob. There's nothing worse than when ordinary people lose their minds. We've lived together for decades, Hindu, Muslim and Sikh, and now we're being told that our differences are more important than what unites us. Like we learned nothing in the war. I don't know how we protect people when hatred's coming from all sides. Graham: Well all we can strive to be.. is good men. And you Prem, are a good man. Jarva Slade: How would you like a warning for insubordination? The Doctor: I'd love one. I could add it to my collection. Charlie: We can't let the systems take control! The Doctor: The systems aren't the problem. How people use and exploit the system — that's the problem. The Doctor: Twirly, I need your help. Twirly: Sleep mode: off. Hello again. Customers with your current medical symptoms browsed blood pressure medication. Yaz: We've gotta do something, Doctor. Graham: The Doc said don't interfere. You said don't interfere, right? Ryan: So much for not interfering. Becka: As King James has written in his new Bible, "Thou shalt not suffer a witch to live." The Doctor: In the Old Testament. There's a twist in the sequel: "Love thy neighbour". The Doctor: These are hard times for women! If we're not being drowned, we're being patronised to death! King James: What do you know of my mother? The Doctor: You could have seen her before she died, but you didn't want to. Why? King James: She left me. When I was not even one year old. What kind of mother does that? Why would I wish to see her. The Doctor: Nobody will ever know why she left you, James. But you can't go hurting people just because you're scared to face up to the darkness inside you. You have to be better than that. King James: Who are you? How do you know these things? Becka: Do you know why the ducking stool was invented, Doctor? To silence foolish women who talked too much. The Doctor: Yeah, I did know that. Which is daft, cos talking's brilliant. Graham: Nice Fjord! That is a fjord innit? Got your bearings yet, doc? The Doctor: [Tasting soil] Norway. Definitely Norway. One of the frilly bits at the top. Graham: D'you think it's safe? The Doctor: I doubt it. It's a juddering dimensional portal in a mirror in a Norwegian bedroom. The Doctor: You want the whole universe. Someone who has seen it all, and that's me. I've lived longer, seen more, loved more, and lost more. I can share it all with you, anything you want to know about what you never had. Cause he's an idiot with a daughter who needs him. So let him go, and I will give you everything. Graham: I need to be honest with you, because I am really grateful for everything you've done for me. Well, for us, you know. Everywhere we've been, all the adventures. Been amazing. But if that is the creature from Sheffield, I will kill it, if I can, for what it did to Grace. The Doctor: Go back to the TARDIS, Graham. The Doctor: I won't let you do that. Graham: You ain't gonna have a say in it. The Doctor: You're better than this. You are. You have to be. If you kill him, I can't have you travel with me. That's if you even live. The Doctor: No, you don't. We're gonna rescue hostages. Anything that compromises them is dangerous. And if you kill him, you become the same as him. The Doctor: Tim Shaw. How long's it been? Tzim-Sha: Three thousand four hundred and seven years. The Doctor: I bet the seven really dragged. So, what happened to you? Tzim-Sha: You did. You corrupted my recall device, banishing me across the universe to this desolate rock for the rest of my existence, unable to leave without dying. This was my curse, for failure. Or so you thought. I arrived, on the verge of death, racked by the DNA bombs. The Doctor: But you got more than you could possibly have wished for. The Ux. The Doctor: None of us know for sure what's out there. That's why we keep looking. Keep your faith. Travel hopefully. The universe will surprise you, constantly. Graham: You've landed on my chair. Graham: You broke my chair. Graham: This is my front room! Graham: Be gentle. He's been through a lot. Graham: No. You have no idea. Aaron: I just want... me and him to be a family again. Graham: Family isn't just about DNA, Aaron. Or a name. It's about what you do. And you haven't done enough. Aaron: What do you need me to say? Hmm? 'Cause I want to say it. Ryan: Okay. You say "Ryan,... I'm sorry. I've messed up. I am never good enough. I've let you down. A lot. And I always made life hard for you. And if it meant that, over the years, you ever felt lonely, or abandoned, or didn't know where to turn, or who to talk to, or how to be, then I'm sorry. 'Cause...'cause you mustn't ever think that you didn't deserve my love." Aaron: You didn't ever think that. Aaron: Yeah. Why wouldn't you?.... Okay. Listen. Here's what you find out when you get older. There's things you done in your life... to others. The decisions you've made... maybe when... things were difficult... you get it wrong. But by the time you realize you got it wrong,... it's too late. You can't fix it because the damage is done. So you run. 'Cause you're too ashamed... to make it right. That's what I did. Ryan: No. You hid when I needed ya. First Mom. Then Nan. Aaron: I'm not hiding anymore. Dalek: Earth is now under the control of the Daleks. The Doctor: No. It's not. You couldn't even control one person. The Doctor: It really won't. Trust me. I've seen them in action. They fall off so many things, including the worst of their own people. They're really something. Have you not worked that out yet? Even the recon scout Dalek, the first ones out of Skaro. Humanity bands together, vanquishes you, and buries you for centuries. The Doctor: Yeah. You're good at that. But it won't be enough. Dalek: This planet is annexed. The fleet will be summoned. The Doctor: You don't have the ability. You don't have the strength. Dalek: You are weak. Humanity is weak. The Doctor: Except... I'm not human. Have a scan. The Doctor: Oh, mate. I'm the Doctor. Ring any bells? The Doctor: Come on then, you lot. Places to go. Yaz: When you say "Places to go",... where're you thinking? Where to next? The Doctor: I was thinking... Everywhere.